Ohio Attorney General and Republican gubernatorial candidate Mike DeWine and his wife, Fran, visited with supporters at Highland County GOP headquarters in Hillsboro Saturday morning. They also dropped in at Momma’s West Main Cafe to visit with patrons there. 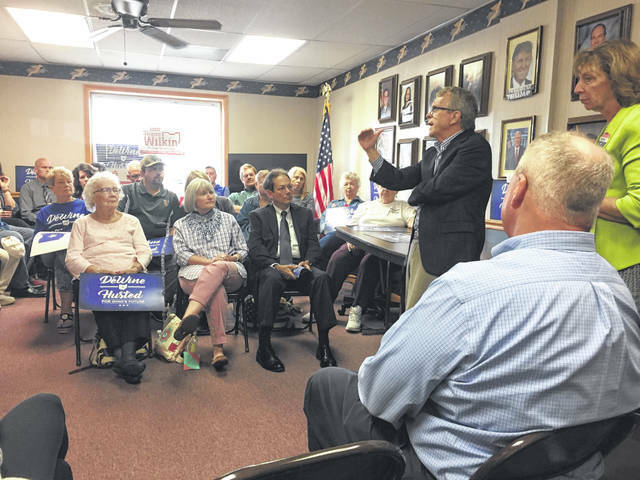 https://www.timesgazette.com/wp-content/uploads/sites/33/2018/09/web1_Dewine-pic.jpgOhio Attorney General and Republican gubernatorial candidate Mike DeWine and his wife, Fran, visited with supporters at Highland County GOP headquarters in Hillsboro Saturday morning. They also dropped in at Momma’s West Main Cafe to visit with patrons there.